Doing migration i got this error . What does rt.jar:1.7.0_79 ? 1. Re: Doing migration i got this error . What does rt.jar:1.7.0_79 ? This simply states that call start from jre version 7 , 79 update. It has nothing to do with exception you are getting. You need to check in which jar ni.servlet.Init is available. Probably your application use this class before , and you miss to put this jar in lib folder of EAR. you need to find in which jar this class is present ; and to add this jar to application. If you find the jar , you have options to import it to wildly using custom modules as well. 2. Re: Doing migration i got this error . What does rt.jar:1.7.0_79 ? Thank you gupta .ni.servlet.Init is a package under src .Must i put it in ear lib? I have all servlet dichiaration in web in that does not install. 3. Re: Doing migration i got this error . What does rt.jar:1.7.0_79 ? I assume this ni.servlet.Init is your own class file. If you are using EAR , then you can place all your required jars in lib folder under EAR , and it will be available for all wars. Please share some more details on your application structure. 4. Re: Doing migration i got this error . What does rt.jar:1.7.0_79 ? First thank you very much for your avaibility. I have the pakage under java resources/src . 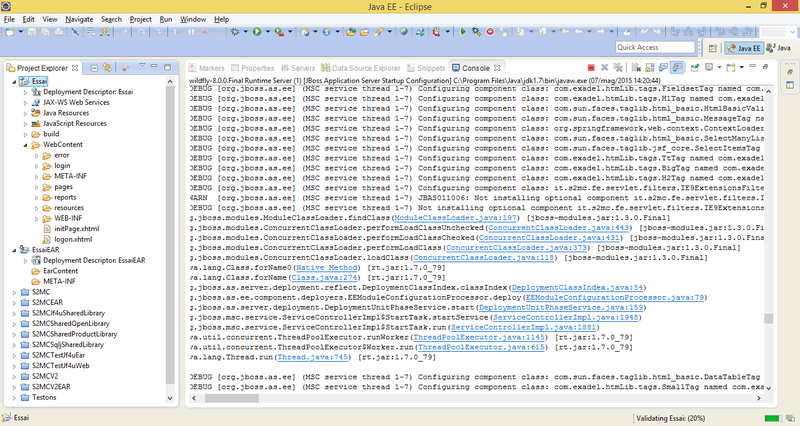 In web.xml i have 5 servlets and all this 5 jboss gives Not installing component JBAS011006: Not installing optional component it.s2mc.fe.servlet.filters.IE9ExtensionsFilter due to an exception. 5. Re: Doing migration i got this error . What does rt.jar:1.7.0_79 ? 6. Re: Doing migration i got this error . What does rt.jar:1.7.0_79 ? Not sure now about what can cause this . Please check once your EAR structure , where exactly that needed class is placed in EAR file . Exception is because class loader was not able to find class. If in EAR this class is NOT in lib , then this could be an issue. I never use eclipse for wildfly deployments , so not sure how this EAR is generated by eclipse. 7. Re: Doing migration i got this error . What does rt.jar:1.7.0_79 ? I think you have to see where is this it.s2mc.fe.servlet.filters.IE9ExtensionsFilter class files are . I Mean you need to find out which jar it is in . Cross check whether that Jar need to be included as separate module or as jsdk extension . 8. Re: Doing migration i got this error . What does rt.jar:1.7.0_79 ? Thanks you sanjay.It is into jre\lib\rt.jar. What must i do now with this rt.jar ? 9. Re: Doing migration i got this error . What does rt.jar:1.7.0_79 ? Thanks you sanjay . it's working but now as i'm doing a migration from websphere to jboss wildfly i want to implemente a j_security check using the "other " default sercurity .Are there specific things to do ? I have the folder "pages" protected. 10. Re: Doing migration i got this error . What does rt.jar:1.7.0_79 ? Great , there are some packages and classes which doesn't not load directly as you might think of which are related with jre , I have no idea why though , but I can help you to fix the issue . Please perform following steps hopefully it will fix class not found error . you will see many paths which are related with the jre are being included here. you have to add the one for the class above. and also make sure that the jar is also available in similar path . 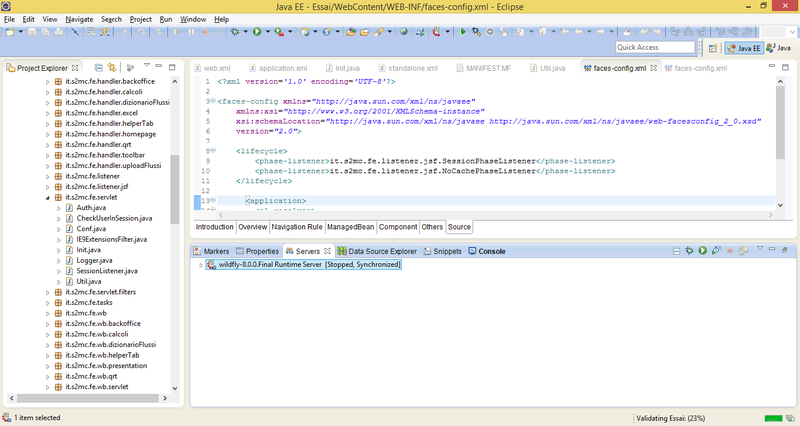 I am taking here example of <path name="com/sun/jsf-impl"/> <-- Adding this is the important aspect of the configuration. Secondly I will make sure that module is there for it . More details can be found in this place , Hope this helps. can you also upload the log file please. 11. Re: Doing migration i got this error . What does rt.jar:1.7.0_79 ? 12. Re: Doing migration i got this error . What does rt.jar:1.7.0_79 ? Ciao great it's my module. I don't have seen anything refered to jre. 13. Re: Doing migration i got this error . What does rt.jar:1.7.0_79 ? Thanks again sanjay. I have change the variable of system (windows) and give the path c:\programmi(x86)\java\jre\bin\java .Also i have add to the module( C:\Users\wildfly-8.0.0.Final\modules\system\layers\base\sun\jdk\main) path name=" sun/net/util "as path name. Sanjay how can i use the security "other " (web.xml) using user.prop and user.role? 14. Re: Doing migration i got this error . What does rt.jar:1.7.0_79 ? how to implemente j security check in wildfly8 using form? how to implemente spring without maven in wildfly8 ?